This photo was taken on November, 2016 at 12:57PM. The location was in the walk way next to the drive in entrance to a very nice moderately priced hotel in the City Center Section of Washington DC. The "Take It!" 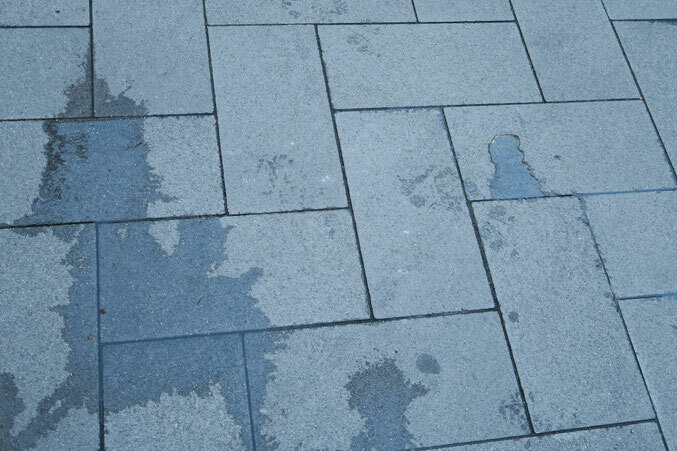 came from noticing the wet remains of a wet morning on the concrete pavers in front of the hotel. The randomness challenged me to come up with a scenario and this is the result. It looks to me, like there is a child riding a pony that is passing by a another child that is catching a ball thrown by a third child in the upper right of the picture (the third wet spot). As you can see, it took me a while to be able to formulate the words to fit this and hopefully you will be able to bring them into play for yourself. The After Take: This one has been done without review of my panel members, but hopefully passes the test. This kind of thing is so much fun, at times I cannot believe I am actually taking these kinds of photos, for the sheer enjoyment of sharing imagination. Hope your winter is passing well for each of you. We see a duck in the big one to the left. These are such fun for the kids! You could make a childrens book out of all your clouds and pools of water. I can't make this one out unfortunately. Guess my imagination isn't quite what it used to be. I'm with Sally on this one, it looks like a duck or goose. Mr. Bruce, you have a better imagination than the majority of the kids I teach. It's quite impressive!